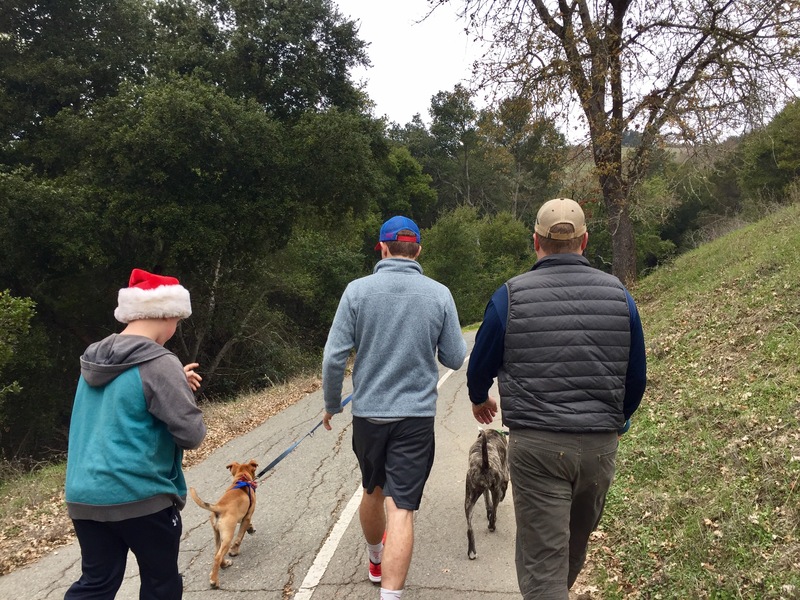 One of our family’s favorite Christmas Eve traditions has been walking the trail around the Lafayette Reservoir. Our first NorCal Christmas, friends invited us to walk it with them; that first walk led to walking it every Christmas Eve (and so many times throughout and over the years), except for one rainy Christmas Eve in the last eleven years. Walking our bodies around the Res makes for scenic exercise; walking with a dog is even better, and this year we had the added fun of walking it with our Big Dog and our Puppy, who had achieved age+shots enough to be out on the town eight days prior. 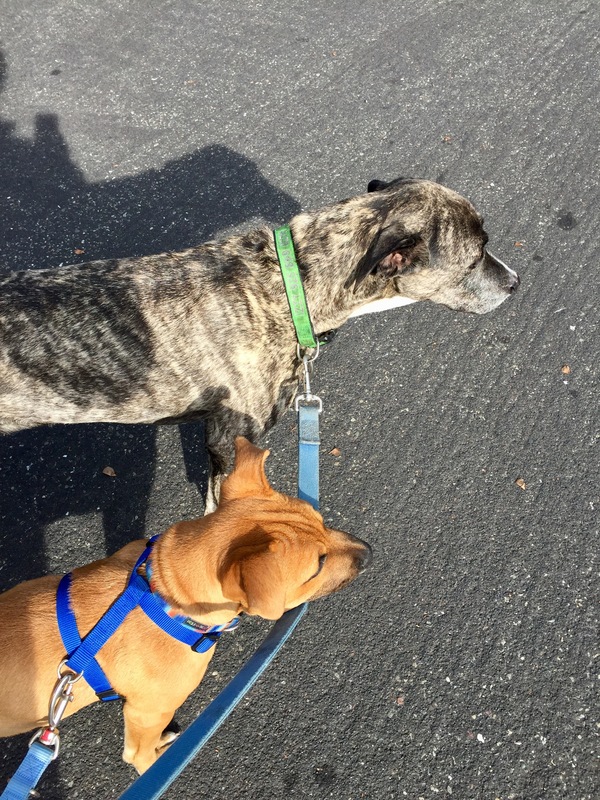 Pups took to the leash like, well, fish to water, except truly, like a dog to a walk! He still wants to bite his harness and barks at anything that moves (humans and dogs, obviously, but also birds and holiday animatronic reindeer…), but he’s getting it alongside his Big Dog sister-teacher. Pups encountered more than his usual number of dogs/people on his first Res walk. Tail wagging, he growled ferociously cute Christmas greetings at each passerby, joyfully accepting head pats as they came. Mostly he kept trucking along at our side. “You can’t keep moving forward if you get stuck looking back…” The words stopped me. I’ve spent hours this week combing through photos, creating what will become a family album. Despite the emotional roller coaster of this past year, it has been refreshing to reminisce about the adventures and the moments overflowing with gratitude that comprised 2017. Still, reminiscing is different than getting stuck. Pups tripped over his own feet trying to move one direction while looking another. The future keeps coming whether or not we want to face it. Looking backwards will trip us up and land us down, scratching our shins if not our noses. 2017 was not my favorite year. It held necessary, good, gut-wrenching and soul-searching work: restructuring who we are as a family in this life stage; rediscovering myself, personally and professionally, and how I live out my calling; and reevaluating relationships and social constructs that may or may not be life-giving in this season. Thank the Lord, 2017 draws nigh to a close. 2018 holds hope for another fresh start. Each year, and each day of the year, we can make the choice to leave the past behind. To thank God for even the misadventures that led us to today. To let go of slip-ups, things done or undone, said or unsaid. To forgive and receive forgiveness, to forgive ourselves as necessary. To choose love, and joy, and hope. To live into our best version of who we are and will become. Walking my little dog will remind me: I need to look ahead to move forward, no looking back.